Sega’s newest light-gun title, Transformers Human Alliance has been installed into its first location – Dave & Buster’s, Orlando FL – as part of their IAAPA 2013 press push. The location is just a short walk or drive away from the convention center where IAAPA is being held, making it easily accessible for visitors to the trade show, other who may not have been able to attend and the general public as well. This latest action adventure game from Sega partners players with one of three of the franchise stars: Optimus Prime, Bumblebee or Sideswipe. Players must battle their way across America, Africa and Europe (with a total of 5 cities to defend) destroying the Decepticons before they find the All Spark, a material capable of bringing any mechanical or electronic object to life. To date, the three TRANSFORMERS movies have taken in over $2.6 billion! It is a brand that’s universally recognised for delivering high quality, high-energy entertainment, and so this is a great title to for an amusement machine, and has brought itself a lot of attention over the last few months. The Bumblebee-themed cabinet is two player, and features a 42” LCD screen. 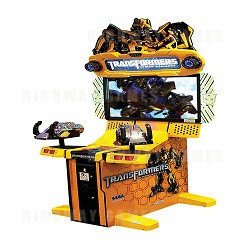 It also comes in a Theatre version which is also Bumblebee themed and features a 55” LCD screen. Both cabinets feature detailed Bumblebee marquees, high definition graphics and LED lighting.